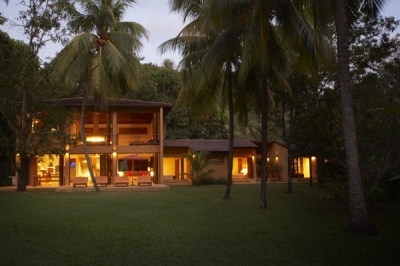 The March House is a luxury beach home retreat on the majestic Pacific side of Costa Rica's Nicoya Peninsula, for sophisticated travelers. March House's completely private accommodation, provides THE most intimate stay anywhere in the area. Built for escape in real soothing tropical comfort, its contemporary minimal design does not distract from its decor, but it is harmonious with the tranquil world just outside, serving as an escape from big-city lives, and a sanctuary for docile relaxation and meditation.With all that said though, The March House is equally welcoming and inviting for children, designed to be "child friendly" without compromising on style. No clutter, no annoying interruptions, no noise but nature's own; easy, pure, and blissful. Once you arrive, you may never want to leave. This luxury rental beach house boasts five distinct, separate bedrooms with built-in fixtures, ceiling fans, large closets, and intimate baths. Hand-carved, louvered doors open each room wide to the tropical flora, warm sun, and undulating surf, blurring the line between inside and out. Read a book on the day bed outside your room, soak in a bath while watching the sunset, or enjoy dinner with friends. At March House, no one has to know you are here, unless you want them to. In addition there is a fully equipped kitchen, including large American stainless steel refrigerator/freezer, eye-level oven and microwave, ceramic hob, dishwasher, juicer, blender, coffee maker, food processor and cutlery and crockery for 12 people. A stereo/CD player has a connection for your iPod. The living area has over sized sofa, large daybed, center table with mood-light, plenty of open space, louvered doors opening all of west wall to patio, dining area with table for ten. A large Patio seamlessly integrates outside with inside space, with four over sized reclining cushioned deck chairs, views of palm and mango trees with beach beyond. This semi-private cove is just 75 meters from patio, with soft white sand, an easy walk to ideal swimming, surfing, and fishing spots. You never get bored in Mal Pais. There is always plenty to do once you tire of lounging lazily with something for everyone within an easy distance. Our very secluded beach lies right on our doorstep -for the adventurous surfer, eager swimmer, relaxed sunbather, or keen angler. If fishing appeals to you the Fishermen's village is THE place to go for fishing excursions and island tours (Just ask, and we can set up a trip for you). Check out the abundance that the sea has to offer. If you fancy snorkeling or scuba diving, its all here - moray eels, cleaner wrasses, surgeon and angelfish, next to colorful puffer and parrot fish. Try hiring a quad bike, a perfect way to get to know the area. The Canopy Tour, with 7 platforms is a great adrenaline rush!Let us arrange this for you. Mal Pais, Costa Rica, a small village, known mostly for its great surfing and beaches, has everything a paradise could offer. The warmth of the sun, the lulling of the surf, and the fragrance of the Flor Blanca, is utterly captivating. It doesn't take long to fall in love. Flowering trees and plants are abundant on the March House property, as well as mangoes, coconuts, oranges, and bananas, a real bonus when in season. We have a 5 x 4 meter "Rancho" in front of the beach, 70 meters from the house, where you can eat al fresco. It has two day beds for snoozing (listening to the waves in the background) and this is the ideal spot to have that therapeutic massage, spa treatment or individual Pilates / Yoga class. We have two dedicated cleaners to service the house daily. Beds are made, sheets, towels and beach towels changed. If you are looking for a top class chef for some special meals, we can provide the right person. Just let us know what you require and we will come up with the perfect solution. WEDDINGS, WEDDINGS, WEDDINGS! The March House is the perfect venue for your romantic beach front wedding.Let our Wedding Coordinator help you plan your perfect day.No wedding is too small or too big.No stress, worries or aggravation.The March House has hosted many successful and happy wedding events and is known in the area for its perfect location. The house and the grounds compliment each other to create the perfect wedding. We also offer a Concierge Service and can arrange the following: Deep sea and in shore fishing,Canopy Tour with 8 zip lines through the forest,Horse and ATV tours though the surrounding hills abundant in tropical vegetation. Birding and wildlife spotting with guide in Cabo Blanco Absolute Reserve. Individual surf lessons and surfboard hire. Massages and Yoga or Pilates in our beachside Rancho. We can hire for you the best in the area. Let us set up all your activities and make you your restaurant reservations, letting YOU enjoy and relax! 3 nights minimum and 7 nights minimum at Peak Times (max 12 persons). This beach is on a small secluded bay. When the swells are good it becomes your own surf break that only the locals know about. There are several spots to swim here and fishing off the rocks often yields a Red Snapper or two. There is sand on the beach and rock pools for the youngsters to paddle in. There is no rip in this bay as there is a small reef just off shore.